While pregnant, it’s easy to start feeling overwhelmed by all of the things you should and shouldn’t be doing. When in reality, it’s usually best just to try your hardest to make good decisions for you and your baby along the way. Balance exercise & rest, try to eat healthy and trust your body on the big day (Really! It’s a pretty amazing thing!). When it’s finally time for baby to arrive, excitement & adrenaline will most likely take over and the rest won’t seem to matter anymore anyway. However, it is good to have some goals going into childbirth and even if everything doesn’t go exactly as you expect, having a birth plan ready can help you feel more prepared and in control on one of the most special days of your life. My first birth experience gave me confidence going into this second pregnancy. 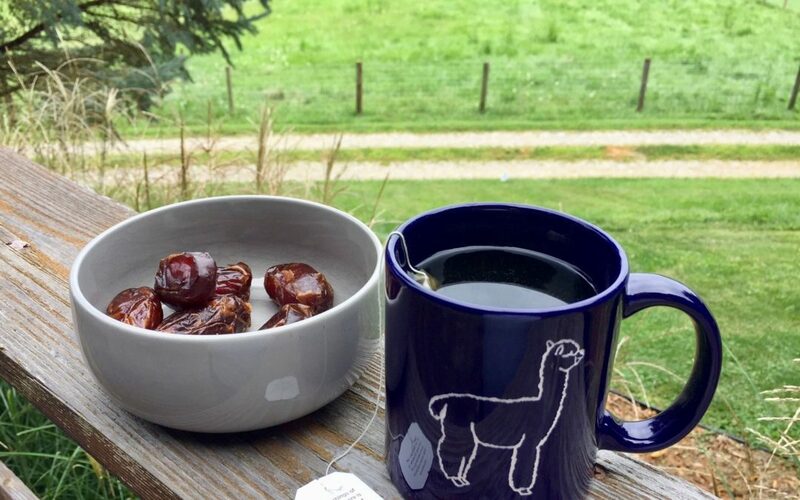 Still hoping to improve the experience in any simple ways I can, I’m eating dates and drinking raspberry leaf tea on the regular. Raspberry leaf tea is an herbal tonic, used throughout history, known to prepare the uterus for delivery and reduce labor pains. It’s recommended for postpartum use as well. Dates have also proven to be a healthy addition to any pregnancy diet and studies show that eating six dates daily aids in cervical dilation, a shorter first stage and increased chances of intact membranes & spontaneous labor. I’m a firm believer in the power of natural aid, prevention & remedies and my preparation for childbirth is no exception. I was in the hospital for awhile before giving birth to my first son (I’d sprung a leak, but contractions didn’t start until a full day later). Despite our lengthy hospital stay, I had a reasonably quick labor once my contractions finally got started – six hours total and only 30 minutes of pushing out my 8 lb 1 oz baby boy. I contribute this in part to all those strong Braxton Hicks I had leading up to that day. My uterus really got a good workout from the copious amounts of raspberry leaf tea I consumed most of second and third trimester. So, I’m drinking the tea again this time and I’ve also decided to give dates a try. I think I ended up reading about the benefits of eating dates during my last week of pregnancy with my first and made a mental note to self at that point to buy a big bunch of them next time around. Surprisingly enough, I remembered! The dates I’ll be eating are Terrasoul Superfoods organic medjool dates (If you plan to eat six dates a day, this bag will last you approximately nine days). They have great reviews and were the lowest price per ounce I could find online. I’ll be honest. I try to buy local as much as possible, but at eight months pregnant, I start to get a little bit of the “just-drop-everything-at-my-doorstep-and-back-away-quietly” attitude, so I’ve been ordering what we need from Amazon lately. Anyway, these arrived yesterday. I’m 36 weeks today and trying them for the first time. I dumped six into my bowl, because that’s the “magic number” of dates per day to ease labor according to research. After eating two with my pretend morning coffee (aka decaf), I decided to put the other four back to eat later today. Very sweet and very.. dense (for lack of a better word). Too much for my taste. Now, before you say it, I realize I could squish these up in a smoothie or some other recipe, but I’m trying to keep life simple right now and I just don’t want to take time out for that. I’ve got plenty of other meals to prep and cook and really don’t need more dirty dishes. So, eating them plain it is. It’s hard to imagine these wrinkly dried fruits can be a vessel for all the nutrients I hope to benefit from. I’m a huge fan of dried figs, but dates, not so much (at least not today). I started drinking Traditional Medicinals organic raspberry leaf tea at the beginning of second trimester. I let it steep for 15 – 30 minutes and then squeeze out the bags to “ensure maximum goodness”. I drank as much as I felt like, whenever I remembered, until third trimester. I then started to drink 4-5 cups (almost) every day. At 38 weeks, I’ll double that. Hey, it tastes great and apparently it also does a body good! If nothing else, it’s a great way to stay hydrated throughout the day and keep my uterus healthy. Last pregnancy and most of this pregnancy, I drank the tea hot, but lately I’ve started refrigerating it and really enjoy it that way as well! I haven’t done any research as to the efficacy of the tea at different temperatures, so hopefully I haven’t strayed too far by deciding to let it cool. So there you have it – What I’ve been eating and drinking to prepare for childbirth (in addition to several well-balanced meals per day, plenty of water and my prenatals, obviously). I’ll post an update to let you know how things go at the hospital! Childbirth is tricky, and they’re all different. So, it’ll be hard for me to ever really know if these dates and cups of tea made any difference at all. Nevertheless, here’s hoping for a relatively short and easy labor! Cheers.